After three films in the space of five years, Sylvester Stallone has ostensibly called time on The Expendables franchise. But just because Barney Ross is bound for an early retirement doesn’t necessarily mean that Stallone is ready to exit the action genre altogether, as he’s reportedly signed on for Escape Plan 3. At least, that’s according to Deadline. Word is that Emmett/Furla/Oasis Films CEOs and co-founders Randall Emmett and George Furla have issued the go-ahead for a third film in the cult action series just as Escape Plan 2 begins to wrap up principal photography. 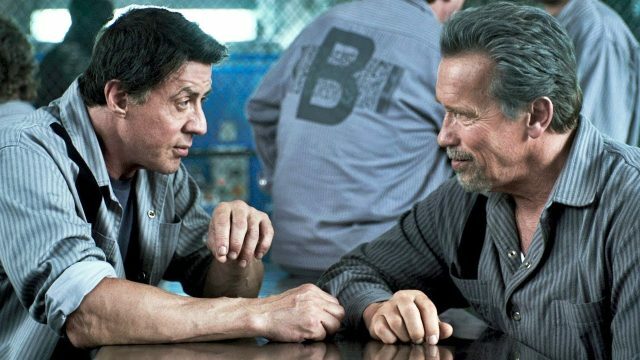 The sequel, directed by Steven C. Miller and tentatively titled Escape Plan 2: Hades, will see the return of Sylvester Stallone’s super-gruff inmate Ray Breslin. Despite rumors to the contrary, Arnold Schwarzenegger (Emil Rottmayer) isn’t involved in the prison sequel whatsoever, allowing the void to be filled by none other than Dave Bautista. The Guardians of the Galaxy alum climbed on in a mystery role just last month, and while story details are being locked away in a maximum security prison, we imagine Bautista’s character will either lend a helping hand to Stallone’s lead, or thwart his attempts at escape. One way or another, we’re intrigued to see how their chemistry unfolds on the silver screen in 2018. Perhaps that alliance/rivalry will bleed over into Escape Plan 3? It’s too soon to tell. After all, Bautista has his Marvel contract to consider, and with Avengers: Infinity War and its untitled sequel due to arrive over the next two years – not to mention the inevitable third volume of Guardians of the Galaxy – we wouldn’t be too surprised if the actor chooses to pass up a third film to avoid headaches with scheduling.